In order to ensure your solar system is operating correctly you should have a data monitor installed as well. Once the monitor is installed get in the habit of actually using it. It takes only seconds to look at the output of the system to know how it is performing. 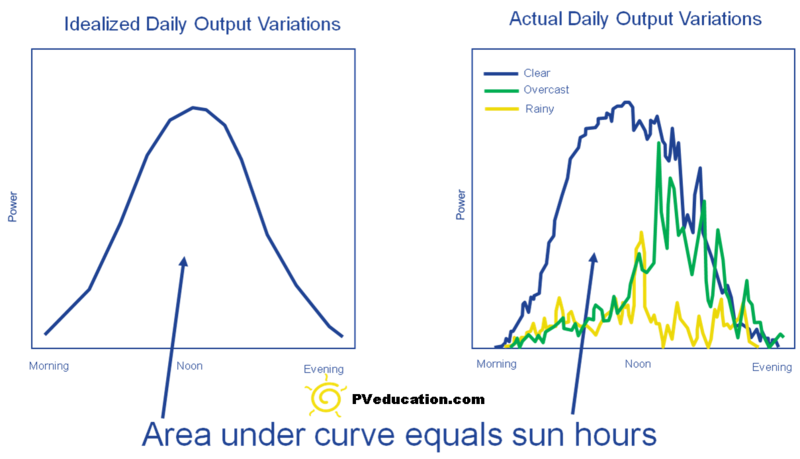 When the output of a solar electric system is graphed with time on the bottom axis and power on the vertical axis it forms a traditional bell curve. In reality the image above on the right is what you will typically see from the system. As clouds pass over the output of the solar array will change through out the day. This is an output curve from my solar system in the middle of February. This system faces south east. This was a nice clear day and this is similar to the typical curve I see. The sun rises and because my house is facing into a shallow valley it has to rise high enough to hit my array so I see a step power increase in the morning. In the evening the system trails off nice and slow as the sun goes behind the array as it sets. What I find interesting about this curve is in the middle of the day. The large increase in output power on this day was caused purely as the result of a temperature change. We were hit by the polar vortex in the middle of the day and the temperature dropped ~30 degrees very rapidly. As the temperature decreases the output of the solar array increases. In this case my system output an additional ~1500 watts of power. Believe it or not, this output curve is from a 24 kW residential system. This was a clear cold day in February and you can see that in the entire middle part of the day the output curve flatten out. This is often referred to as power clipping. In this case the DC solar array is 20% larger then the AC inverter rating. There is nothing wrong with this design or how the system is operating. The inverters are simply limited to 20 kW of output power. This is something that doesn’t occur often so there is little power loss over the course of the year. You might design a system like this because in the summer when you have longer days you also have heat. The added heat is enough to lower the output of the solar array so that the inverter won’t clip. A design like this will yield a lower system cost. With that said you also have to be careful with your sites location. This is in the mid-Atlantic. If you are in a colder location you will see more clipping and you migth consider keeping the DC array to AC inverter power ratio closer to 1.